zenpundit.com » Blog Archive » McCaining it now McCain is gone.. This entry was posted on Sunday, September 2nd, 2018 at 4:19 am	and is filed under Charles Cameron, McCain, obama, obit, photography, poetry, Uncategorized. You can follow any responses to this entry through the RSS 2.0 feed. Both comments and pings are currently closed. 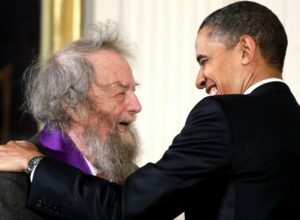 What a great post with Donald Hall! The photo with Obama is priceless. Legend. Thanks, Charles! Thanks, Sally, I’m so glad you liked this post. A vital change in thinking that must occur will be the acceptance of contrarians and iconoclasts. Acceptance of contrarians and iconoclasts is a requirement in the education and development of strategic thinkers. In the Army and in SOF, contrarians and iconoclasts are seen as non-team players. We need team players who can suppress their ego to those of the group, but we also need people who know when to defer to collective desires and when not to conform but rather challenge the status quo, current beliefs, and institutions for the good of the organization. Unfortunately, in the Army a contrarian, iconoclast, and a team player cannot exist in one person. We need people who are prepared to rock the boat and to challenge our senior leaders to think broadly when it is required without fear of retribution, being labeled unpatriotic, and shown the door.